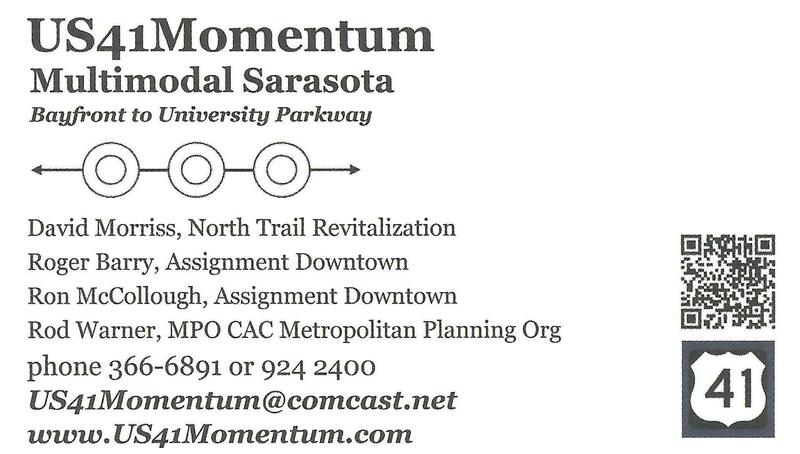 Compress FDOT North Trail and Bayfront Connectivity work calendar to create a unique-in-Florida multimodal corridor on a Federal Highway, featuring 11 modern roundabouts with iconic center islands — branding Sarasota as the cultural center of the state. Update: initial segment from 10th: to 14th street programmed by FDOT to open in 2016. Total of ten prioritized by MPO. Ringling Blvd @ US41 to submit to MPO in early 2o14. Urge FDOT to compress the FHWA regulation process to establish momentum to consolidate construction so as to limit work interruption of US41 traffic flow and open the revitalized US41 roadway earlier. Update: US41Momentum constantly interacting with the FDOT and the FHWA to compress calendar and consolidate construction. Encourage FDOT to concurrently construct US41 roundabouts at Fruitville, Gulfstream, and Main roundabouts with 10th Street to 14th Street to relieve in season Ringling Bridge back-up caused by current signalization configuration – in advance of the September 2017 International Rowing Competition. Update: In process and encouraging. Expect City & County to dedicate staff and advance fund to achieve the Momentum goals. o Update: Achieved in 2013. · Encourage FDOT to concurrently construct US41 roundabouts at Fruitville, Gulfstream, and Main roundabouts with 10th Street to 14th Street to relieve in season Ringling Bridge back-up caused by current signalization configuration – in advance of the September 2017 International Rowing Competition. o Update: Underway process and encouraging.